People’s MTA says money for subways, not Wall Street. New York — Members of the People’s MTA (PMTA) advocacy group delivered blistering remarks at a public hearing of the Metropolitan Transportation Authority’s Wall Street-oriented board on Oct. 25. They denounced the lack of accessibility in this city’s 113-year-old public transit system, which has become a cash cow for the banks to the tune of billions of dollars in profits. The MTA recently announced it would remove seats from 100 subway cars by an undisclosed date. This news angered New Yorkers who have already been frustrated with the lack of accessibility for people with disabilities, people who push strollers and shopping carts, and others who need elevators to access the subway. Only one out of every four subway stations provides elevators. In another swipe against riders, trains with foldable seats debuted earlier in the week on the L subway line, which connects eastern Brooklyn with the West Village in Manhattan. This is meant to pack even more riders onto already overcrowded trains. 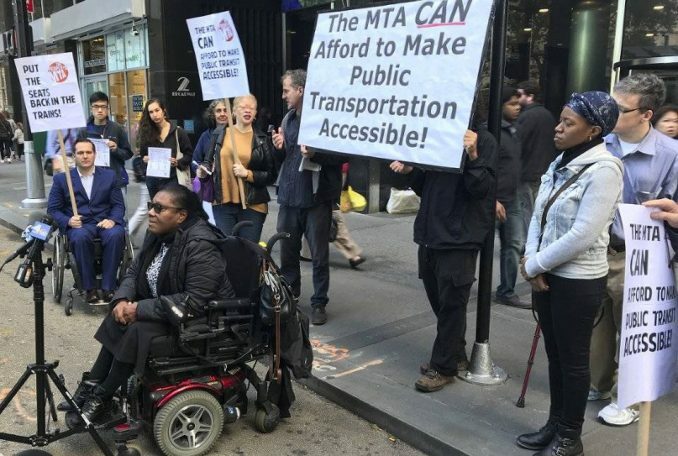 Activists say the most sensible response would be to cancel the MTA’s $35-billion debt and use that money to build a system with more trains and buses, in compliance with the Americans with Disabilities Act of 1990. Terrea Mitchell, a longtime disability rights activist, was skipped over during the public hearing portion of the MTA meeting, even though she had followed the protocol to get on the speaking list. Folks familiar with Mitchell’s fiery speaking style suggested this may have been a silencing tactic. Members of the group are conducting research to submit a formal complaint to the board. Eman Rimawi, an amputee and disability rights activist who works for New York Lawyers for the Public Interest (NYLPI), told the board it took her three hours to get to the meeting because her Access-a-Ride driver was late and subsequently stuck in morning rush-hour traffic. Several members of the disability community complained to the board about the rudeness and tardiness of Access-a-Ride and authorized taxi drivers. These services are supposed to make up for the lack of elevators in most subway stations. 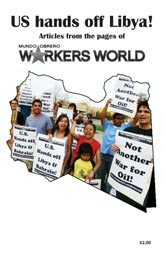 Before the hearing, activists had held a rally and press conference in front of the MTA’s headquarters, just a few blocks from the offices of its Wall Street creditors. “Every media outlet in the city was there. At the press conference, the microphones of major local TV news were on the mic stand. But none of this was covered by the corporate media, which are colluding with the MTA to deny riders accessibility,” explained Tony Murphy, a PMTA activist. One of those who helped build the outside rally was wheelchair user Mary Kaessinger, who said: “The constant subway breakdowns and mass delays show that public transportation is not being run for the benefit of the riders — and this is especially true for anyone who needs an elevator or cannot use the stairs. Public transportation is a service, not a business. But banks are profiting handsomely from public transportation — from tax-free debt-service payments — while the riders suffer.